One really nice thing about working on games for me, especially something like Thimbleweed Park where I'm intimately involved in the design is I can weave things into the story that are very personal (as long as they can make sense to the overall direction). In my particular case, besides studying computer game and digital art, I spent a lot of my formative years working in the comic book industry. I certainly learned a lot of my artistic craft growing up in the 60's and 70's reading comics and copying sequential panel art. 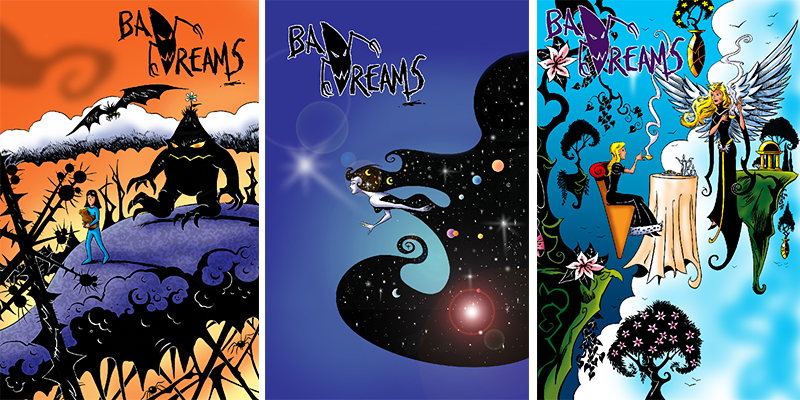 Most recently, my own comic book Bad Dreams , which I wrote and drew over the last several years in my copious spare time was published as a limited series by Red 5 comics and is now coming out this June in a trade paperback edition and here's my shameless plug. This experience has also led me to creating a number of other comic books, some of which might actually be showcased at ThimbleCon of all places (at this point I'm not saying how much or many - that will have to be a surprise). Depending on audience reaction some could even be developed further. That's part of the beauty of independent adventure game and story development as you brainstorm stories and ideas you never know exactly what might make it into your final design, but you're free to try any idea. Ron and I are constantly drawing from our own life experience and warping that into whatever demented shape we can to achieve a compelling story, we did it for Maniac Mansion and we're doing it for Thimbleweed Park. No, we didn't actually murder anyone, or build a reactor in the bottom of a swimming pool, but the characters, relationships and situations certainly have a lot to do with us, our sense humor and how we think. Art does really have a tendency to imitate life, particularly when a designer or an artist is creating something as personal as an adventure game story, certainly that's been my experience working with Ron. As far as the stylistic visual approach and situations besides drawing from a number of B grade horror movies, I also looked toward my love of classic EC comics for further inspiration, including ‘Tales from the Crypt and ‘The Vault of Horror' which believe it or not generally offered up their own macabre comedic twists. pre-ordered... looking forward to it. Anyway, is this bad dreams paperback the complete series in one volume? So *that's* the secret of Monkey Island! Okay, now I want to know even more details about who the rest of the characters in Maniac Mansion were based on! "comic books, some of which might actually be showcased at ThimbleCon of all places." Gary, your comic book looks interesting and reminds me of the game "Little Nemo: The Dream Master" for NES. work early in my career and there's definitely some influence. Aha. Thank you very much for your enlightening comment, Gary! ^_^ My favorite comic is "Finn och Fiffi" (Swedish translation) and it was made by a guy from Belgium that was friends with the creator of Tintin. I also like other comics (including manga). Aha! Good old Suske en Wiske! Well, I am from Belgium and grew up reading all these comics drawn in "ligne claire" style. I guess 8-bit pixel art can force the same feeling due to its technical limitations (which is a good thing). Perhaps that's why I immediately felt at home in the Maniac mansion as a kid. Can you Tell us which kind of Comic Books where crucial for you in you're childhood? Marvel, DC, Disney or the french belgium stuff? Love the old Maniac Mansion origin stories. Please feel free to share more. Just found that on Soundcloud and want to ask you if you know it ??? Gary, are you as a graphics guy/God involved with the font C64? I contacted the people behind it and they said they will add the foreign characters to the C64 font (for Swedish translation for example) and then let you use it in Thimbleweed Park. :-) They told me they don't want money for it, but would love a copy of the game (and I think the font creators should be in the game's credits). I've chatted with the people who made the C64 font and like you said, they are willing to make any changes we need. Are you planning Comixology release as well? I mostly read my comics digitally these days. And should also be releasing the graphic novel to coincide with the printed book. Thanks for letting me know, I also buy everything digitally now. Just got the full collection from Comixology. I appreciate the CBZ drm-free download. Can't wait to read it!